47 New Officers Graduate from NECC Methuen Police Academy, Two Graduates Join Methuen Police Dept. 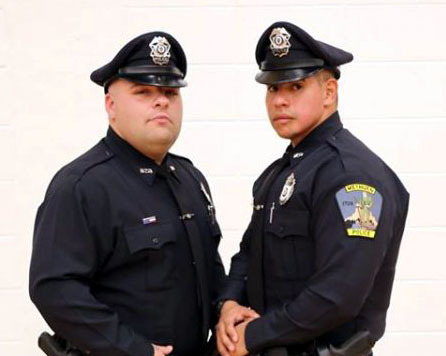 Officer Joseph Alaimo (left) and Officer Javier Reyes-Bustos (right) joined the Methuen Police Department after graduating from the Northern Essex Community College/Methuen Police Academy last week. Methuen Mayor Steve Zanni and Police Chief Joseph Solomon are pleased to announce that 47 new officers graduated from the Northern Essex Community College (NECC)/Methuen Police Academy last week. On Friday, Oct. 14, at 10 a.m., 47 new officers from 24 local cities and towns graduated from the NECC/Methuen Police Academy. The ceremony took place at the NECC campus in Haverhill. The 25-week academy is a combination of practical training, classroom training, certifications and service to the community. Classes include first aid and first responder training, law, applied patrol procedures, firearms training, report writing, active shooter training, an emergency vehicle operator course, a bike patrol course and defensive tactics. Of the 47 graduates, two are now full-time Methuen police officers. Officer Joseph Alaimo and Officer Javier Reyes-Bustos both successfully completed the academy and will complete their field training for the next three months. Officer Reyes-Bustos received the “Top Gun” award during graduation, which is given to the student officer who achieves the highest score in a gun range shooting competition. During the badge pinning ceremony, Officer Alaimo was pinned by his father, Retired Methuen Deputy Police Chief Joseph Alaimo, who served the Methuen Police Department for 30 years. The Methuen Police Department also had two self-sponsored student officers graduate last Friday. Officer Richard A. Lipinski and Officer Roderick M. Wiggins are now police academy trained and seeking employment with local cities and towns.